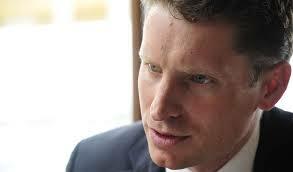 Liberal Canning candidate, Andrew Hastie, looks like a younger Cory Bernardi, but unlike Bernardi, the would-be representative stubbornly refuses to concede that his own Christian views are any business of the electorate. How could they possibly influence his politics? If only the media would stop asking about his beliefs. He would rather talk about ice. Hastie, who refuses to be drawn on the topic of creationism, his theologian father’s speciality, today suggested that the WA state government double its current mandatory penalties for ice dealers who serve underage clients; endanger children. It is an unworkable, ill-informed, irresponsibly punitive proposal but it may get him known for being tough on drugs. Above all, it resonates with a government which punishes asylum seekers for arriving by boat; punishes the poor and disadvantaged, the unemployed for being a drain on the Budget bottom line when there are billionaire miners it needs to subsidise. The Liberal candidate, of course, revealed his hand. In his clumsy bid to divert questions about his father’s creationism and his stunt to gain the attention of an electorate underwhelmed by blow-ins, let alone geeks bearing ice-war gifts, the former SAS captain unwittingly drew national attention to his own limited political, intellectual and moral horizons. Naturally Hastie needed to change the subject back to fit his image; something manly, some alpha male posturing; an SAS unarmed combat assault on ice rather than admit he is a creationist like his Dad. The people of Canning are no doubt suitably impressed by this facile substitution. Give us the rhetoric of war and toughness, they plead. Who cares if it is a load of bunkum? Who cares if it after years of it from Barnett, the drug problem is booming? Andrew Hastie told assembled reporters that he would ignore their questions about his beliefs, his father’s creationism, his wife’s homophobia. ‘People are sick of this crap,’ he said. How does he know? How dare he presume to know? Perhaps they are just keen to know who their new fly-in candidate really is. Perhaps they are rapidly finding out. His last underwhelming stunt was to hire a plane to fly a banner across the skies of Canning towing a banner which read VOTE 1 HASTIE. Doubtless the presumption and the crass sloganeering would endear him to his new-found bestie, the PM. Class act, Andrew Hastie, as the Liberals have packaged him, was parachuted into the electorate Canning on the death of man of the people Don Randall at the behest of Julie Bishop who says she was greatly impressed with the politically and socially conservative young SAS Captain Hastie when she sat down with him for a chat over morning tea in Afghanistan. As you do. Of course Hastie was not on his anti-drug crusade at that stage. But he was wearing a uniform. Drug abuse amongst serving troops would not have entered the conversation. Australia’s military code of denial has helped keep it off the national agenda, too. There is no reason, however, to doubt Hastie’s recent comments that he has had personal experience with friends who had been affected by illegal drugs and was passionate about finding a solution. It is more than likely that some of these may have been soldiers. Whatever the case, he owes those who suffer ice addiction more than the tired old cliché of a war on ice. He would do well to abandon any macho tough on drugs posturing and explore ways of understanding and treating the needs of those suffering addiction. Ice is popular with returned soldiers. It is a local substitute for the heroin which is so cheaply and readily available in the narco-state of Afghanistan today, largely as a by-product of western intervention. Whilst the Department of Defence denies that Australian soldiers using heroin or opiates in Afghanistan is a problem, therapists who work with returned servicemen tell a different story. 27,500 Australian soldiers served in Afghanistan since 2001. There have been 40 fatalities. The conflict has been Australia’s most intensive commitment since Vietnam. Yet after Vietnam, those in command knew that many recruits, even those physically unhurt, would not return home unscathed. PTSD rates amongst returning soldiers are about twice the rate of the civilian population. Drug and alcohol abuse is a problem. A war on drugs is the last thing these returned soldiers need. They have been through enough horror; enough punishment. Surely there is something more useful the aspiring candidate, with all his military insights could be offering. And as for the parliament, the people of Australia already have one Cory Bernardi. Two is one too many. Time to get real, Mr Hastie. Get some real policy. We have more than enough sloganeering, alpha male shirt-fronters with their meaningless, simplistic ‘solutions’ wasting our time and money in national politics already. It seems to be another Captain’s Pick about to go south. The sad thing is once CANning becomes CANTing, Abbott will get the boot. Abbott is progressive politics best friend. He alone will ensure wilderness for the Liberals for a decade at least. « Abbott bombs in Syria before bombing in Canning.